I originally wrote this post last year and it is one of my favorites because of the sweet memories it brings back to me. Hope you enjoy! One of my Dad’s hobbies/talents is making jewelry and working with rocks. He taught classes in Lapidary (the art of transforming stones, minerals and gemstones into decorative art). I was definitely a Daddy’s girl and would hang out with him at class or in the basement when he was working. I learned how to cut, polish and facet stones at an early age. On the weekends, we would often set up booths at local craft shows. My mom would sell her crafts and my dad would sell his jewelry. I was too young to roam around the shows on my own so my dad came up with the idea of letting me have my own table to sell individual polished stones. My dad gave me several large jars filled with different kinds of polished gemstones. I sorted them into plastic containers, made cute labels for each type and sold them for five cents each. I remember feeling so important and proud of myself! In my mind, my rock table was just as important to the family business as the big tables. What a powerful lesson for a little girl. According to my father, I had a very unique sales technique. If someone looked at my rocks but then started to walk away without buying one, I would burst into tears. The customer would inevitably feel sorry for me and would buy a few rocks. Hmmm… I wonder if that sales technique is taught in universities these days! With the success of my rock sales, I would love to say that I made lots of money and saved it for an important purpose. However, I was just a kid and the lure of the grape snow cones was too enticing. As soon as I had earned 50 cents, I would close my shop and buy a snow cone. Then I would open the shop back up and start all over. At the end of the weekends, I was generally a very happy business-girl with a little bit of a tummy ache. My dad could have easily told me to play with my toys, read a book or follow my big brother around. But, he didn’t. He enabled me to try something new. I learned about rocks, jewelry making, sales displays, counting money, talking with other people and, of course, entrepreneurship. These are still lessons that I carry with me today. I'm all grown up now, raising four kids and running a business with my husband. I am proud to say that I no longer use the “Crying” sales technique. However, I still have a weakness for grape snow cones! Happy Father's Day to all the Daddy's out there --- especially mine! 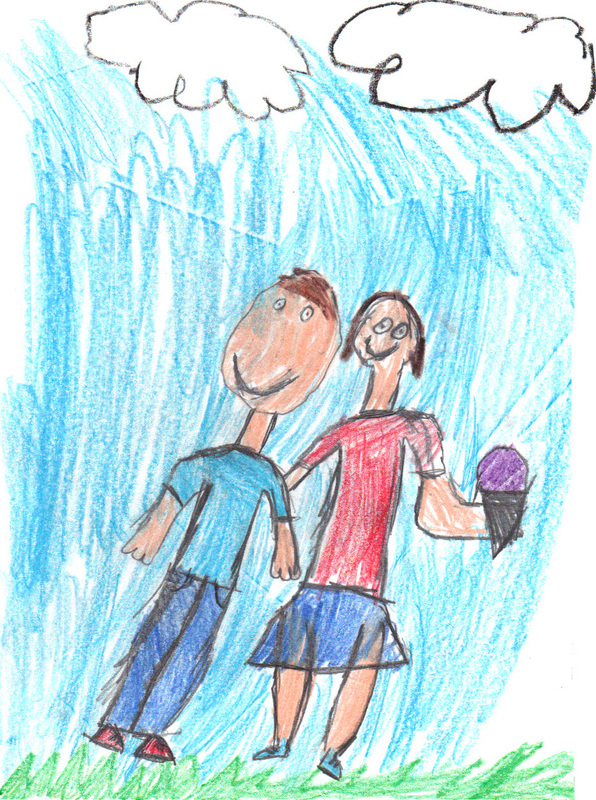 Special Note: The artwork for this blog was custom drawn by the youngest Whitlock. What a brilliant story! I love the idea of throwing you in at the deep end, a brilliant way to teach you some of lifes lessons! That was indeed a very special sales method! Did You Make Money Mistakes as a Teen?